An update during August had already indicated that revenue would be £8.5m and pre-tax profit would be £2.0m. The only number that did not improve in the second half was the dividend. After the first-half payout was raised by 0.02p to 0.46p per share, the final payout for the year was trimmed by the same 0.02p to 1.74p per share. 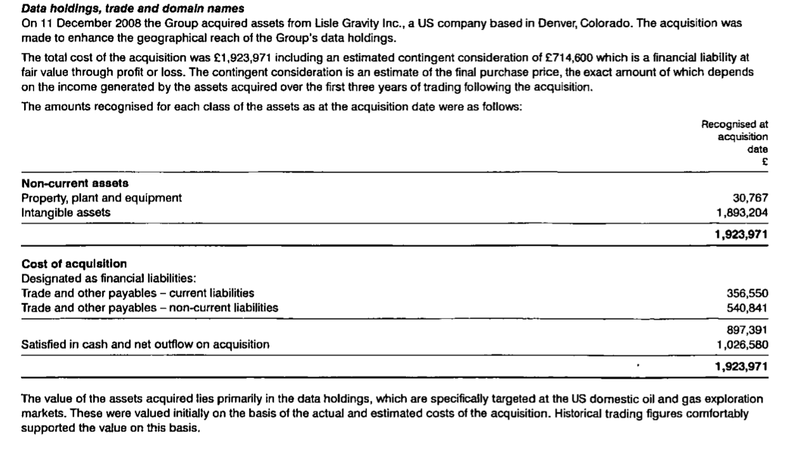 GTC bought fellow geosciences consultancy ERCL during April. The £4.3m price-tag exceeded GTC’s annual profits and so prompted me to raise an ‘amber acquisition alert’. Anyway, a look at the accounts reveals some interesting numbers relating to ERCL. Due to be published next week, the 2015 annual report ought to confirm how much ERCL contributed after purchase and what exactly the numbers above represent. GTC’s interims from March revealed the business capitalising a substantial £482k of development costs onto its balance sheet. Despite this £1m-plus of development and intangible expenditure representing half of the £2m accounting profit, GTC did not make clear what all the expenditure related to. The reference to a “three-year development period” indicates there could be further hefty development expenses to come — most of which could also travel directly to the balance sheet. Without more detail, it looks to me as if reported profits are being inflated — and I need to investigate this point further. With current-year profits set to come in “substantially below current market expectations”, judging GTC’s valuation on an earnings basis is tricky. Profit estimates are made trickier by GTC serving relatively few customers and collecting somewhat lumpy income. For instance, these results recognised the majority of a single $5m contract — which probably represented at least 30% of the year’s revenue. My best guess is to assume the current depressed year will achieve a negligible operating profit and that a return to the good old days will see operating profit reach £2m again (seen in 2013 and 2015). (True, a negligible profit may prove to be too pessimistic this year, but that is counterbalanced by GTC spending significant amounts on intangibles. I can foresee GTC reporting a break-even year on a cash flow basis). As such, a middling year could therefore see a £1m operating profit, which after 9% tax (aided by R&D tax credits) would equate to earnings of 2.8p per share. That’s just enough to cover the 2.2p per share dividend. What is more certain is GTC’s balance sheet, which carries a freehold with a £2.6m (8p per share) book value as well as net cash of £3.7m. Taking into account the aforementioned £980k earn-out, and making a few minor adjustments for other working-capital items, I make net cash to be £2.3m or 7p per share. With the shares at 40p and market cap at £13.1m, I reckon GTC’s enterprise value (EV) to be 33p per share or £10.8m. The P/E on my EV and middling EPS guess is therefore 12. That valuation does not tempt me to top up just yet, especially as I need to learn more about that development expenditure and study the finer details within the forthcoming annual report. Nonetheless, GTC does have net cash, should survive the current downturn and demand for its range of specialist data and services ought to rebound as and when the oil sector recovers. When that recovery occurs, of course, is anyone’s guess. * Next events: Ex-div on 19 November, AGM on 8 December, 1.74p final dividend paid on 17 December. I would be interested to hear your thoughts on Billington Holdings. High stock ranks, but doesn’t seem to have much coverage. Just wondered if you had considered it and rejected it, not yet considered it, or were getting round to publishing your findings. Thanks for the comment. I vaguely recall looking at Billington (I think it is the steel scaffolding business) a few years ago when the shares were in the doldrums at <40p. I think the management changes then put me off, though I never got round to digging any deeper sadly. It is not high on my to-do list at present. I have been doing some digging into past GTC reports and found this from the 2009 edition. Essentially it explains what could be going on with the ‘mysterious’ £304k fair-value adjustment I mentioned in the Blog post above. 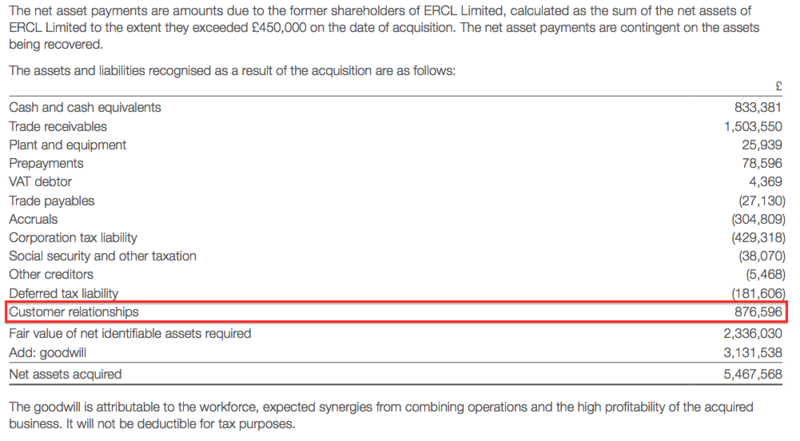 I believe the £304k adjustment and the £298k impairment are indeed linked to the ERCL purchase. You see, GTC has form in making acquisitions and then quickly lowering its guess for the deferred consideration and writing off some of the purchased goodwill. Then in the 2009 accounts, we see profits were hit by a £463k goodwill impairment and bolstered by a £465k fair-value adjustment on a financial liability. I am not sure why the impairment and fair-value adjustment did not match exactly in 2009 (or indeed 2015), but the differences are insignificant. I am sure the £980k figure I mentioned in the Blog post above does relate to the deferred ERCL consideration. But it won’t include any deferred consideration that is set to be paid within the current year. That liability (if it exists) will be in current liabilities, and should be disclosed in the upcoming annual report. Looking at the figures, I wonder if the latest deferred consideration is the £1,550k original figure less the £304k fair-value adjustment = £1,246k, of which £980k is a non-current liability and £266k is a current liability. I will publish another comment when the annual report is available and I have finally resolved all these figures! “Getech (AIM: GTC), the oil services business specialising in the provision of exploration data and petroleum systems studies and evaluations, is pleased to announce that it has now signed further clients to fund its new global multi-satellite gravity project. So my theory is the sponsors have given GTC £1m-plus, of which £1,060k was spent during FY14 and FY15 on the first full-year data-set from CryoSat-2. As such, it is probably right that GTC capitalises this expenditure as it ought to be a long-lasting asset for the business. I think for the accounting, this sponsor cash payment would be declared initially as deferred income in the liability ledger (similar to an upfront payment for a year’s magazine subscription) and the associated revenue may not have been recognised at present. As such, I am beginning to become happier with the development spend, as it appears GTC is not capitalising its own operating costs. Excellent work as always. I was also a little concerned that there may have been a change in accounting policy which had the effect of superficially boasting EPS in the short term but looking through the Annual Report the company expensed as incurred £1.341m of R&D in 2015 compared to 0.953m in 2014 which certainly doesn’t suggest they have transferred any R&D spend from the P & L to intangibles. Thanks for the comment. Yes, I have been studying the Annual Report today and, as you say, R&D of £1.3m was expensed, so I’m convinced the development spend must be this satellite project. 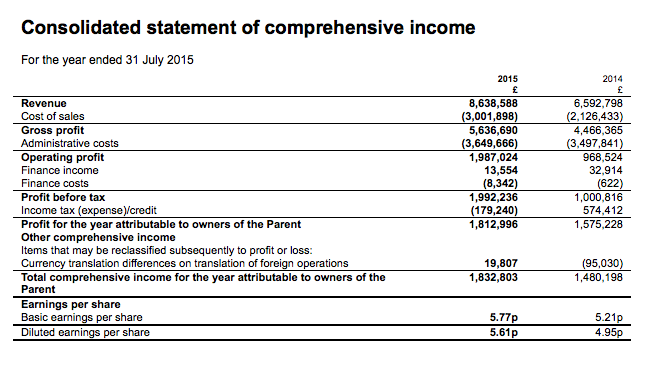 Also, the deferred income entry shows a c£1m increase, which ties in with my theory. True, deferred income can increase because other customers may have paid upfront for different contracts, but I think the latest trading guidance suggests this is unlikely to be the case. My theory about the mysterious £304k fair-value adjustment also looks correct. Anyway, I will post my thoughts on the AR possibly tomorrow or Monday. Lots to go through here. That figure increased by £951k during the year and, although this entry will be affected by any upfront payment for other contracts, the tone of GTC’s current guidance suggests the likelihood of receiving such other pre-payments at present is small. For the current year (FY16), I expect GTC to capitalise further development costs paid for by sponsors as this multi-satellite project leads up to GTC receiving the final part of the data during mid-2016. I suspect any material revenue from this multi-satellite project will be first produced in the financial year to July 2017. All told, I am happy there is nothing untoward going on here with capitalised development costs. These are indeed post-acqusition adjustments. As well as writing down part of the asset acquired, GTC has ‘written up’ (i.e. reduced) the value of an associated liability. The liability in this case is the deferred consideration for ERCL. The accounts don’t show it, but I believe the original deferred consideration would have been £2,035k plus £304k fair-value adjustment = £2,339k. So as I suspected originally, these adjustments suggest profits at ERCL may not be as high as originally expected. 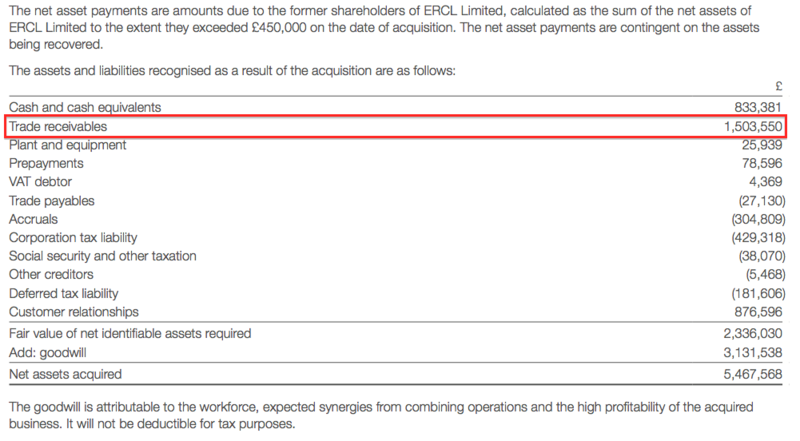 (Footnote: the post-acquisition impairment of ERCL’s ‘customer relationships’ may not be too surprising when you read how the initial value was calculated. Those look aggressive assumptions to me. All this leads me to believe GTC re-jigged the initial deal in order to pay ERCL (via a new net asset payment arrangement) what money this trade debtor eventually pays (less tax and the other liabilities ERCL carried). Because of this extra net asset payment, it is not clear from the accounts what exactly the deferred consideration based on profits for ERCL currently is. All I can say for sure is that the £977k ‘other payable — held at fair value through profit and loss’, which is set to be paid after one year, is part of this particular consideration. I wondered in my Blog post above just how much ERCL contributed to GTC during its 4 months of ownership. The answer is revenue of £936k and a pre-tax profit of £230k. More than I expected, actually. 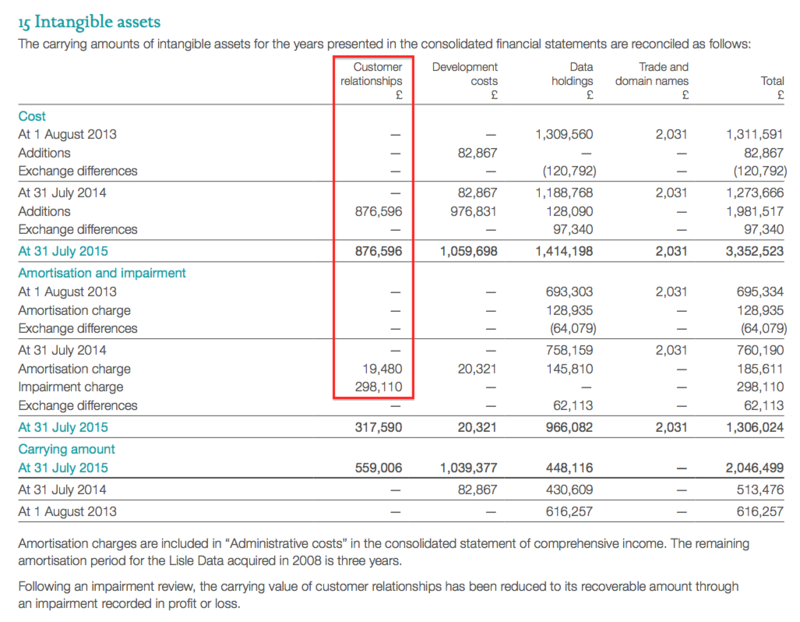 Without ERCL, I calculate GTC would have reported revenue of £7,703k and a pre-tax profit of £1,762k. I calculate ERCL during the full-year reported revenue of £4,235k and a pre-tax profit of £1,600k. The £230k contribution extrapolated over a year gives £690k. I suppose that does not make the underlying £4.3m price-tag super-expensive. I see GTC has prepared a note to head off any dissent about the valuation of ERCL. The firm has calculated the net present value of ERCL plus its other similar project division to be £7m. But it seems GTC has re-jigged its allocation of costs. For FY15, the divisional profits add up (almost) to the group gross profit, so the divisional profit figures are gross profit figures. For FY14, the divisional profits are £1m below the group gross profit figure, and I can only assume those prior numbers included other divisional expenses (probably R&D). All told, nothing to worry about but a presentational note would have helped I think. GTC has received another £280k rebate for R&D tax credits. That could make calculating the firm’s tax charge easier. Phew. That is it. I hope all this makes some sense. I must admit GTC could have helped matters by explaining some of adjustments in the accounts. But I believe there is nothing untoward going on and actually I am more reassured by the business now that I seen the annual report and thought more about the numbers. Thanks Patrick — good spot! I see GTC shares have sunk to 24p. Following the warning about 2016 trading in the recent results, how low could the price go? GTC’s all-time low occurred in 2010. Non-exec Peter Stephens was able to pick up the shares for 11p during April and July. In hindsight they were smart purchases — assuming you took profits on the way to 100p a few years later! The (interim) results immediately prior to those purchases of Mr Stephens showed revenue down 51%, a loss of £392k and the dividend passed. Net cash was a measly £7k, too. With no earnings and no dividend, net asset value (NAV) was the only valuation crutch back then. At the time, GTC’s NAV was £4,021k, or 14p per share. Less intangibles, tangible NAV (TNAV) came to £2,986k or 10p per share. So there is a precedent for GTC’s shares to trade just above TNAV. Back to 2015 and GTC’s latest results showed a TNAV of £5,029k or 15.3p per share. So perhaps the current price could sink to something like 16p to 17p. Right now GTC enjoys a more secure financial position — net cash at the last count was £3.7m. But the outlook is not great: “there remains significant uncertainty about the short term and we cannot predict how the market will develop during 2016…” Oil is presently sub-$40 a barrel. The sole broker forecast I can find at present is for pre-tax profit of £700k and earnings of 1.7p per share for 2016. 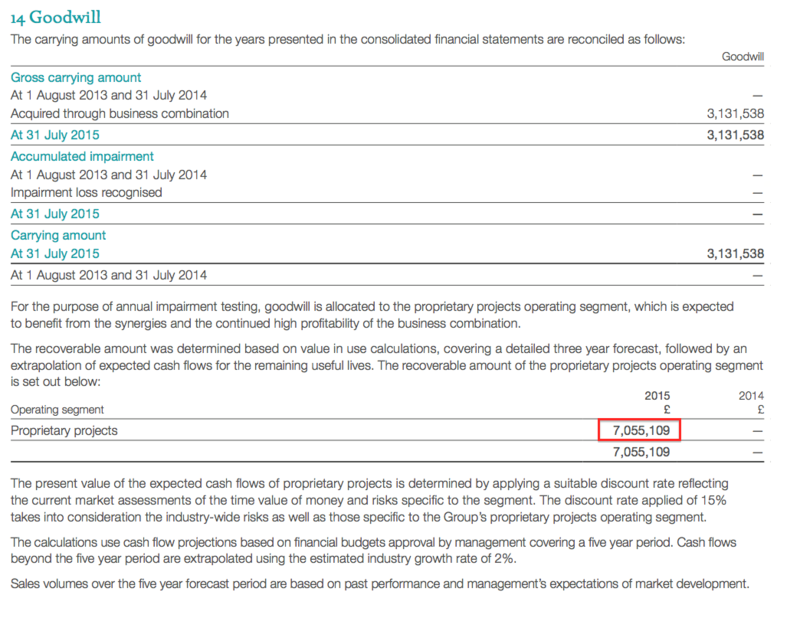 Those projections compare to £2m and 5.8p per share respectively for 2015. I do wonder if GTC’s next results (interims for the six months to January 2016, due in March), could show a break-even performance or loss. Given the grim environment for oil services outfits at present, I get the feeling the company has guided the broker to a H2-weighted performance to meet that aforementioned 1.7p EPS guess. Still, to put GTC’s current share price into perspective, here are a few more sums. The group’s latest TNAV was £5,029k. Less the recent 1.74p per share dividend payment, TNAV then comes to £4,457k or 13.5p per share. The bulk of that TNAV is represented by cash and freehold property. Meanwhile, the current market cap at 24p is £7,895k. You could argue the difference between the market cap and the TNAV — £3,438k or 10.5p per share — is the inherent ‘intangible’ value of the group’s magnetic and gravity databases. In comparison to the implied £3,438k ’database’ value, GTC has since its flotation ten years ago earned a total post-tax profit of £7.7m. So… the theory is that a bidder can buy GTC for 24p a share, effectively own cash and property with a net value of 10.5p per share and obtain a database for 13.5p per share that has produced aggregate earnings of 23p per share during the last decade. You could also argue GTC’s TNAV may be understated a bit, given the books show it could pay at least £980k (3p per share) for the earn-out of ERCL. If ERCL’s profit does not meet expectations, GTC’s TNAV could improve by a not insignificant amount. That said, the net cash position could go the wrong way if the next results do show a loss. “The Board announces that Raymond Wolfson is stepping down as Chief Executive Officer and director of the Company with effect from no later than 31 July 2016. In the interim until a new CEO is appointed Mr Wolfson will continue in the role of CEO and the Chairman, Stuart Paton, will increase his level of day to day involvement. Mr Wolfson was appointed CEO of Getech in 2007 having been a non-executive director since it started trading as a separate company in the year 2000. Following his resignation as CEO, Mr Wolfson will take on the role of Commercial Director which will be a non-board position and will provide continuity for the new CEO, as well as advice and support on a range of matters including commercial, financial, regulatory and contractual. Stuart Paton, Chairman said “The Board is extremely grateful to Raymond for his outstanding contribution and commitment over many years. He has been a key part of the growth of the company following its spin out from the University of Leeds in 2000. The Board will now actively seek a replacement and considers that, for the next stage in the Company’s development, a person with direct industry experience and knowledge is required. A specialist recruitment agency has been exclusively retained for this search. This could be ominous. The chief exec suddenly steps down at a time when the group’s oil and gas clients are experiencing very difficult trading conditions. The worry is that the board has just got wind of the first-half results (six months to 31 Jan 2016), the figures and outlook are not great… and have decided fresh leadership is required. Mr Wolfson, who I don’t think has really done much wrong in his time at the top of GTC, is demoted to Commercial Director. I note that the statement did not contain any comments from Mr Wolfson himself. It would make sense if Zinc was retained. I also wonder if this move opens the door for Huw Edwards to become GTC’s chief exec. He is one of the co-founders of ERCL, the geoscience consultancy bought by GTC during April last year, and was appointed as a GTC executive board member after the purchase. Mr Edwards appears to have a more entrepreneurial background than Mr Wolfson, and he also owns 2.68% of GTC. I would welcome his appointment as GTC chief exec. Anyway, let’s see what happens. My earlier comment about GTC’s valuation recalled how these shares have in the past traded at book value when times became very hard — but then rallied spectacularly when the good times returned. I wonder if any forthcoming bad news could provided a similar buying opportunity.